Fetching water from the open surface water ditches is a thing of the past for the 1200 primary school children and their families. 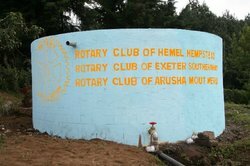 On Monday, 20th November, 2008 the first water was drawn out of the standpipe at the school. Rotarians from the three contributing Rotary clubs - Arusha Mount Meru, Tanzania and Exeter Southernhay, England and Hemel Hempstead, England met Elis, the Lower Village Elder, N'Giresi Village Chairman Mzee Lotti, Secretary, Benjamin Loitopuaki Mollel, the Official Government Water Engineer, Mahammed Lazier + 3 committee ladies (10 on committee). The 3.5 kilometer pipeline and water tank were inspected prior to the opening ceremony at the N'Giresi primary school. The second phase of the project is to get water down the west of the village to the secondary school. The young and old fetching contaminated water from the open ditches. Now in the past as the new supply of fresh clean water is switched on. The source of the water from the spring up the mountain. A small reservoir has been created.